The Master begs for a reorientation of the viewer, perhaps requiring more than one viewing...there's nothing easy or conventional about this account of a doomed search for external meaning, doubling as a meditative tone poem on human frailty. 137 min. The Weinstein Company. Director: Paul Thomas Anderson. Cast: Philip Seymour Hoffman, Joaquin Phoenix, Amy Adams. "We are on a journey that risks the dark." So says the spiritual flim-flam man who is, ostensibly, the title character of The Master. Because this is a Paul Thomas Anderson film, it is a journey that risks (darkness being a given), and the identity of the story's master remains in intense contention. Like Anderson's previous film, There Will Be Blood, The Master puts its primary focus on an unstoppable force-meets-immovable object war of wills between two men. Freddie Quell (Joaquin Phoenix) returns home from World War II psychologically damaged and, like so many fellow veterans, struggles to reintegrate into American daily life. His "nervous condition" leads him, lurching aimlessly, deep into drink, trouble, and eventually The Cause, a cultish organization created and lorded over by Lancaster Dodd (Philip Seymour Hoffman). Dodd sees something in Freddie, recognizes his pliability, finds him amusing, useful, and perhaps attractive; he takes a shine to Freddie's moonshine and the kind of man who would make it, calling him "the bravest boy I've ever met" (Dodd is married, one hastens to note, to Amy Adams' Peggy). The Cause, modeled on early Scientology, offers vague direction but charismatic leadership in its L. Ron Hubbard-esque leader. Dodd preaches of attaining an "inherent state of perfect" and offers self-defenses like "Even the smartest of our current scientists can be fooled." Freddie, for his part, shows a prowling, animalistic need for a pack to which he can belong and also, perhaps, a yearning to bring meaning to his existence. The Cause does nothing to quell Quell's violent temper, but in the film's most potent scene, Dodd's "processing" exercise brings up troubling past memories: not the past lives Dodd claims to be able to access, at least not literally, but an unsatisfactory relationship Freddie bobbled before the war. Dodd's brand of psychological button-pushing and unscientific boasting (such as being able to cure leukemia) are, in their way, as reckless as Freddie's acts of physical endangerment, though The Master remains decidedly minimalist of plot and resistant to any kind of narrative payoff. Anderson, who also scripted, makes the audience work hard for coherence and meaning, and some will find their patience sorely tested by his elliptical approach. The film's unequivocal pleasures are Mihai Malaimare Jr.'s photography (shot on rare, extra-sharp 65mm film), brilliant period production design by David Crank and Jack Fisk, and the performances by Phoenix and Hoffman. Phoenix, in particular, cuts a startling figure: drawn and stooped, Phoenix wields a Brando-esque spontaneity capable of eruptive force of feeling and physicality. Hoffman's Dodd, though more canny and confident, appears to be "making all this up as he goes along" and likewise harbors mercurial moodiness. Anderson's risks don't always pay off; they haven't all come out in the wash of the editing room (turbulent waters, appropriately, serve as a visual motif). But The Master begs for a reorientation of the viewer, perhaps requiring more than one viewing of the film; there's nothing easy or conventional about this account of a doomed search for external meaning, doubling as a meditative tone poem on human frailty. 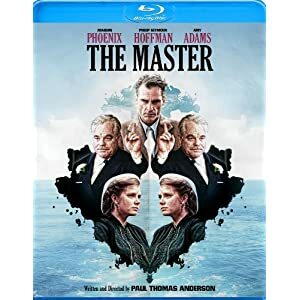 Anchor Bay delivers an excellent Blu-ray special edition of The Weinstein Company's awards season heavyweight The Master. The hi-def transfer derived from a 65mm source yields exceptionally beautiful picture quality and detailed resolution. This is just about as good as home video gets at the moment (until everything goes 4K): perfect contrast, revealing detail, and subtle, richly rendered hues. No complaints, either, about the impeccable DTS-HD Master Audio 5.1 mix, which gives a robust treatment to Jonny Greenwood's Oscar-nominated score and recreates the subtle (okay, mostly front-and-center)surround sonic environment enjoyed in theaters with a crispness also enjoyed by the prioritized dialogue. Kicking off the bonus features is an A/V suite called "'Back Beyond': Outtakes, Additional Scenes; Music by Johnny Greenwood" (19:59, HD), a montage of excised footage set to Greenwood's musical material. While a more straightforward scene-by-scene presentation would perhaps clarify Anderson's narrative choices, that's probably not something hes particularly interested in doing, and this more artful approach is certainly characteristic of the film. The behind-the-scenes short "Unguided Message" (7:59, SD) constitutes B-roll set footage, a nice glimpse into Anderson's method. The most important extra here is John Huston's 1946 documentary "Let There Be Light" (58:06, SD), a primary inspiration for the film in its exploration of the troubled psyche of veterans and a possible approach to treatment. While this film has been freely available online for some time, and it's unfortunately not afforded an HD transfer, at least its handy-dandily paired here with Anderson's feature. All site content © 2000-2019 Peter Canavese. Page generated at 04/18/2019 01:09:41PM.